When I made Boston Cream Pie last week, I started thinking of all the different versions of white cake I’ve made over the years. I use this one in my Boston Cream Pie mainly because it’s a rather plain foil for the cool creamy custard and gorgeous ganache icing. It’s super easy; a one bowl mix up. It’s great for busy days or beginners. It’s so quick to make it often doubles at my house as an emergency “save” when I need something fast or unexpectedly. It’s a great foil for any number of rich variations of fillings and frostings – it’s perfect for trifles. It’s suitable for anyone who likes to make up their own mixes and have them on hand. Toss all dry ingredients in a ziploc. This is a cake that’s sturdy, not too sweet and rather lean. I wouldn’t necessarily call it exquisite – after all it only has a handful ingredients and a one bowl mix up. It’s a workhorse, though. Kind of like a favorite jeans kind of cake rather than a special occasion dress up one. It’s also dirt cheap to make and it’s possible you have all the ingredients on hand. Preheat oven to 350 degrees. Spray or oil the bottom only of two 8″ or one 9″ cake pan. Dust with flour and knock out excess. In a large bowl, beat all cake ingredients with an electric mixer on low-speed for 30 seconds, until all ingredients are mixed together, stopping to scrape down. Turn mixer to high and beat an additional three minutes, scraping now and then. Pour batter into prepared pan(s) and bake about 20 minutes if using an 8″ pan or 35 minutes if using a 9″ pan, or until a toothpick inserted in the center comes out clean. Cool on rack 20 minutes, then remove cake and continue cooling. This entry was posted in Click here for Fabulous Food Posts and tagged betty crocker, Cake, Desserts, Easy Recipe, Frugal Hausfrau, white cake. Bookmark the permalink. Nothing wrong with jeans, I say. And certainly nothing wrong with this cake. 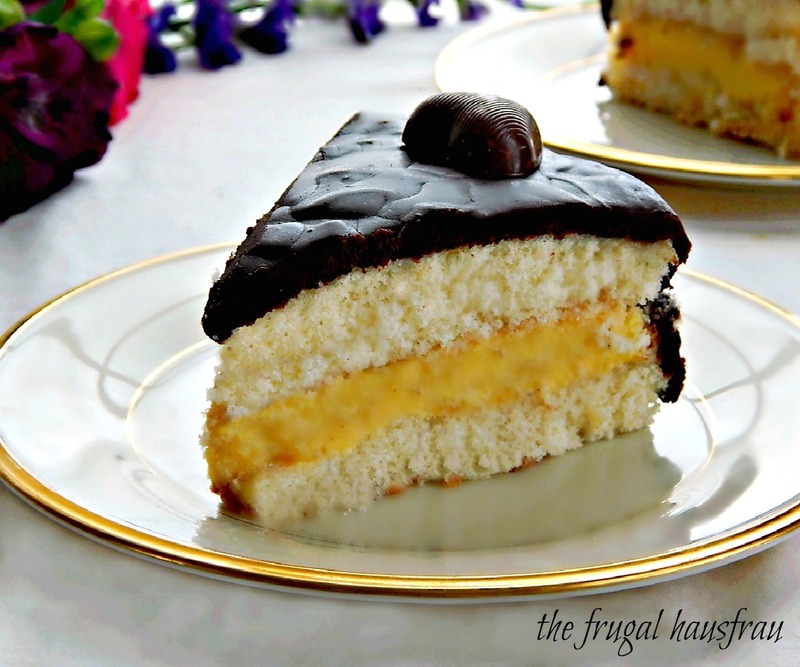 A beautiful vehicle for the Boston cream pie! It’s seldom you see my OUT of jeans! LOL! It’s always good to have a basic cake recipe on hand, thank you! I know, right?! I haven’t thought about spice cake for awhile, but it IS one of my faves!